100 local educators visited campus last week for the Third Annual Educational Technology Collaboration Day, to participate in a day of professional development and learn more about how to use technology in the classroom. For the third year in a row the Graduate School of Education and Allied Professions (GSEAP) invited local educators to participate in a day of professional development to share ideas for using technology in the classroom. Last week, 100 educators from around the state filled the Dolan School of Business dining room to participate in the open forum-style event. 30 people presented topics ranging from lego robotics to iPad apps for educators. Doug Casey, executive director at the Connecticut Commission for Educational Technology, and representatives from Apple Education were in attendance. Attendees moved from table to table learn new and innovative ways to use technology in their classes. Elisavet Kousidis of Rippowam Middle School presented at the event; Kousidis will graduate in May from Fairfield’s Ed Tech program. Representatives from Apple Education conducted iPad demos covering helpful apps including screen recording and how to use augmented reality. 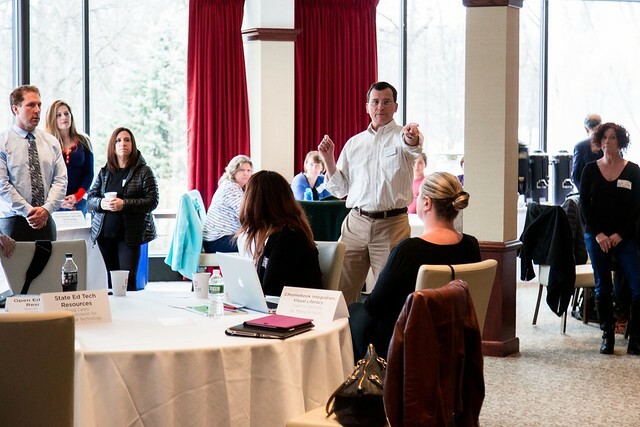 Kevin Corcoran, executive director of Digital Learning and adjunct professor at Fairfield University, spoke to participants about Open Educational Resources (OER) including OER Commons where educators can share lesson plans and other educational resources free of charge. Students will learn the concepts and practices of Open Educational Resources including copyright law, fair use exemptions, and Creative Commons licensing. In this hands-on course, students will learn how to build online publications and ePub books as well as examine the link between pre-computer “interactive” books and the digital capabilities that exist today. In this course, students will unpack the student and the educator standards released by the International Society for Technology in Education (ISTE). Students will also create their own technology-rich ISTE Standards teaching units. To learn more about summer course offerings, visit the website or contact Joshua Elliott, EdD assistant professor of the practice, director of Educational Technology.